A simple question can easily lead to instant craving really! 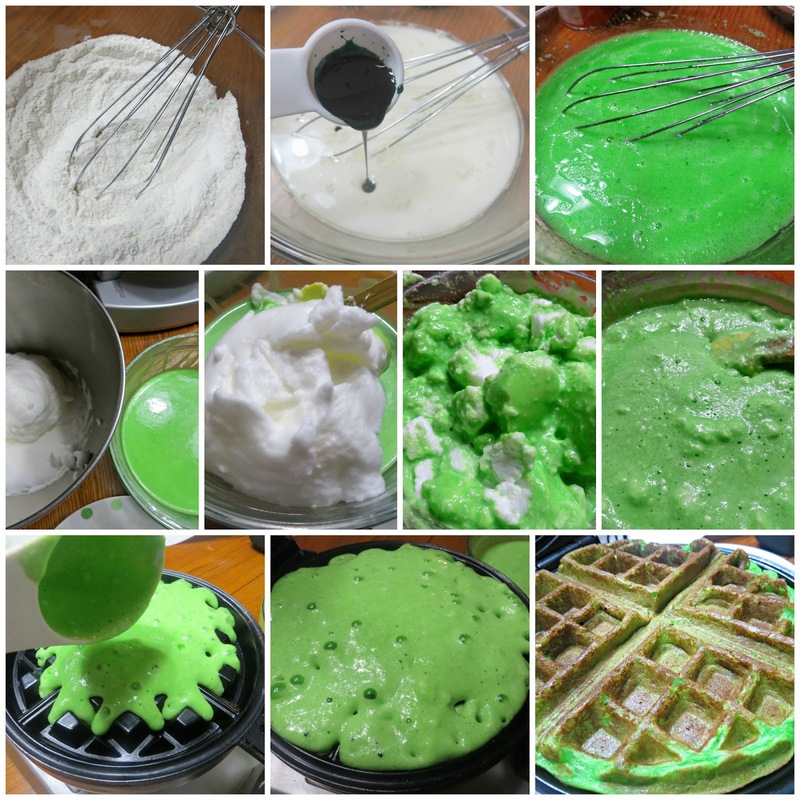 Someone asked if I have a recipe for pandan waffles somewhere here in my blog and I just realized that I don't even after making numerous pandan concoctions in the past. One thing led to another and the next I know- my mind was busy thinking of light and crispy on the outside-tender inside green waffles with a creamy coconut flavored goo on the side or just coconut cream cheese frosting. I just have to make them and that was my dinner! Making waffles is easy- just sift, whisk, stir, whip, fold then cook. Fortunately, I have all the ingredients needed so I was munching the airiest; crispiest and lightest waffles in thirty minutes and that includes the time I spent processing my coconut cream cheese frosting. It was meant to be a dipping sauce but I ended up with a frosting like consistency which is yummy! The trick in making airy and crispy waffles is separating the eggs; whipping the whites till stiff before folding it into the batter. I also used a combination of all-purpose flour and rice flour which gives it that delicious crunch. I love the pandan and coconut tandem so I flavored the frosting with coconut extract thus maintaining that tropical Asian flair. Add flours and baking powder to wet ingredients and mix thoroughly until smooth. Set aside. Whip egg whites in a separate bowl until stiff. Gently fold into the waffle batter. Place half a package of softened cream cheese; 1/2 cup half and half; a teaspoon of coconut extract and three tablespoons sugar in a blender. Process until smooth and creamy then transfer into a bowl and serve with the waffles. I added the half and half slowly until I reached the desired consistency. You may add a little milk to loosen it more if you so desire. Oh wow! I've never heard of Pandan before, but now I want to try it! It gave the waffles such a vibrant color, too! It is very popular in Asian cuisine. I hope you can try it. What kind of rice flour is it? Regular rice flour or the glutinous/mochi rice flour? I used Mochiko but mixed with all-purpose flour which gives the crisp exterior.